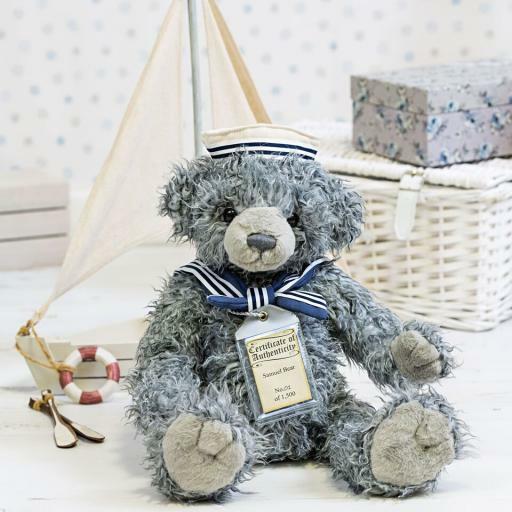 Raggedy Samuel is a hit with the nice girls, because he's a sailor! He has short curls in shades of light and dark grey. His round muzzle and pads are a complementary silver-grey, and he has defined fingers and toes. Samuel has endearing black shoe button eyes, and a dark grey embroidered nose. He wears a traditional square blue sailor collar, tied at the front, fisnished with dark blue and white dtriped edging. He's also sporting a doughboy sailor hat. Aswith all the Silver Tag bears, Samuel is fully jointed, substantiallyweighted, and has a classic hump. Samuel comes with an individually numberedCertificate of Authenticity. He is 48 cm standing. Samuel is one of 1500. Hecan be spot cleaned.